When most California visitors think of beach trips, they think of the popular surfing spots and boardwalks of Southern California's hottest beach spots, but San Francisco visitors need not go any further than their own backyard to enjoy the natural wonders of the Pacific Ocean coastline. The 82,000-acre Golden Gate National Recreation Area preserves a wide variety of beach spots throughout the city's greater metropolitan region. 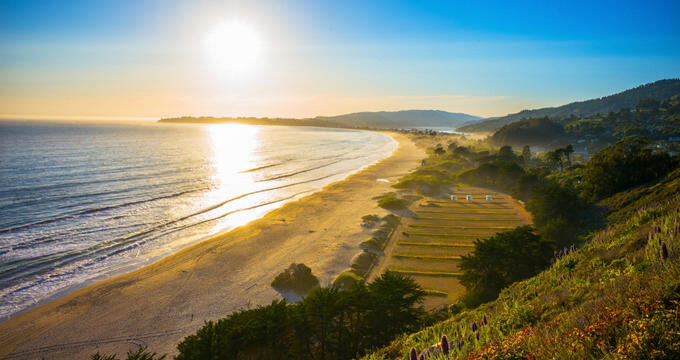 Stinson Beach is a stunning pristine beach near San Francisco, located within the Golden Gate National Recreation Area in Marin County. The National Park Service-operated beach, which is located approximately half an hour from the Golden Gate Bridge, is accessible from Marin City via daily beach bus service and is known as one of the Bay Area's top day-trip getaway spots. Gorgeous swimming beaches are among the most pristine beachfronts in the Bay Area, with ample opportunities also offered for surfing fishing, beach volleyball, and hiking. Cold waters create foggy atmosphere year-round, making for beautiful scenery against the backdrop of the nearby Muir Woods National Monument and Mount Tamalpais. 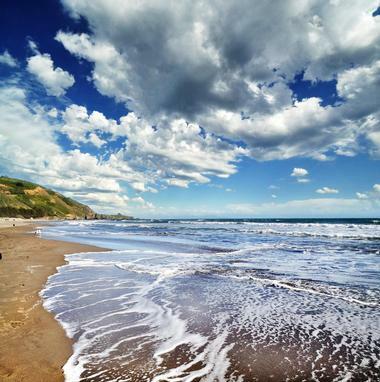 Agate Beach Park is a stunning 6.6-acre beach located near the ciy of Bolinas, located within the jointly-operated federal and state Duxbury Reef State Marine Reserve, which protects significant marine life habitats and resources. Nearly two miles of expansive Pacific Ocean shoreline are offered for visitors to explore at low tide, with swimming opportunities offered during the summer months. Beachgoers can also explore the beach's beautiful tide pools at low tide, which are often filled with marine life. On clear days, views extend as far away as the Farallon Islands. Other activities at the beach include shoreline fishing and wildflower observation, though visitors should note that disturbing natural habitats via collecting or other activities is prohibited by law. Marshall's Beach is one of San Francisco's hidden shoreline gems, accessible via the Batteries to Bluffs Trail in the Presidio north of Baker Beach. The extremely photogenic beach is one of the city's best spots to view the Golden Gate Bridge, the Marin Headlands, and the Pacific Ocean, giving the illusion of remote wilderness despite its location minutes from the city's downtown area. Though the small beach extends for less than 1,000 feet, its secluded location make it a prime spot for escaping the hustle and bustle of the city for a waterfront day trip. Great opportunities for birdwatching are offered, along with occasional chances to view whales from the shoreline. The beach is also clothing-optional due to its isolated location, offering opportunities for natural sunbathing. Baker Beach is a gorgeous section of the expansive Golden Gate National Recreation Area, which preserves over 82,000 acres of shoreline park and beachfront areas within the San Francisco Bay Area. The beach is located less than two miles from the Golden Gate Bridge, providing photographers with great opportunities for snagging shots of the famed landmark. Portions of the beach are clothing-optional. Beachgoers can also fish in the waters of the bay or explore the historic Battery Chamberlain, which preserves the final six-inch disappearing gun on the American West Coast. Portions of the beach near Lobos Creek allow beachgoers to frolic with their four-legged friends off leash under voice control. Ocean Beach is San Francisco's most-visited public beach, stretching for more than 1.5 miles within the Golden Gate National Recreation Area. The foggy, atmospheric beach's waters rarely get warmer than 60 degrees Fahrenheit, making the beach difficult for swimming, though some adventurous surfers, kitesurfers, and skimboarders still brave the chilly conditions. However, fishing is popular at the beach's rocky areas near the historic Cliff House restaurant, which has been in operation since the late 19th century. Below the Cliff House, the 1949 Camera Obscura lets visitors view the surrounding oceanfront via rotating lens. Bonfires are also common at the beach, as is kite flying and wind-powered kite buggying. Visitors should note that picnicking is difficult at the beach due to its windy conditions and that alcohol and glass containers are not permitted on the beachfront. Fort Funston Beach is San Francisco's southernmost Pacific Coast beach, located within the Golden Gate National Recreation Area. The beach is one of the best spots in the United States for enjoying hang-gliding, with windy conditions that help gliders soar high in the air above the city's skyline. Beautiful 200-foot sand bluffs flank the beach's coastline, making for beautiful scenery for beach strolling, beachcombing, and relaxation. Other popular beachfront activities include horseback riding, fossil collecting, and shelling. Pets are permitted off-leash within most of the beach's sections and surrounding areas, making it a great spot to enjoy the scenery with four-legged friends. 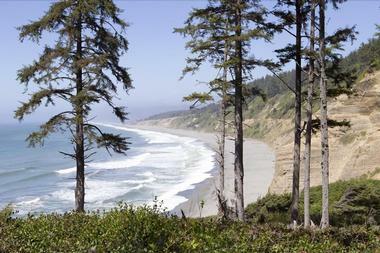 Nature trails at the beach connect it to nearby historic sites such as the World War II-era Battery Davis, as well as adjoining beaches such as Mussel Rock Beach. Gray Whale Cove State Beach is a lovely California state park located near the cities of Pacific and Montara, approximately 18 miles south of San Francisco's city center. The 3.1-acre beach, which is also commonly referred to as Devil's Slide, has long been one of California's top naturist beach spots, with no new regulations enforced for beach clothing as of the park's 2001 state takeover. Its sheltered cove is surrounded by tall cliffs that drop off directly into the Pacific Ocean, accessible via a steep beachfront trail. True to its current name, visitors can observe gray whales along the beach's shoreline, along with occasional great white shark sightings. A small day-use picnic area is also offered, along with chemical toilets at the beach's upper parking lot. Montara State Beach is a great spot for surf fishing along Half Moon Bay, located in the shadows of its namesake mountain within the beautiful Santa Cruz Mountain range. The beach is the Half Moon Bay region's only remaining undeveloped coastal mountain habitat, stretching for approximately one mile. Though shell collecting and beachcombing are prohibited by law, visitors can explore the beach's tide pool areas at low tide and observe wildlife and shoreline scenery. Four-legged friends can explore the beach with their owners on leashes up to six feet. Overnight accommodations at the beach are offered at the lighthouse on Point Montara, a restored historic facility, and at several nearby state park campgrounds. Pescadero State Beach is a mile-long state beach near San Mateo County's city of the same name, located approximately 15 miles from Half Moon Bay. The beach, which is named for the Spanish word meaning "a place to fish," is accessible via State Route 1 and serves as a popular spot for fishing and tide pooling at low tide conditions. At low tide, the beach connects to adjacent San Gregorio and Pomponio State Beaches. Visitors should note that permits are required for fishing and shoreline collecting. Across the highway, bird watchers can spot blue herons and other shorebird species at the Pescadero Marsh Natural Preserve. As the weather changes quite frequently along the shoreline, beachgoers are advised to bring jackets or other clothing layers when visiting.